Based on ethnographic field work conducted during the 2014 Reclaim the Power- Anti Fracking Action Camps, using participant observations, informal discussion and interviews, this study explores coalition formation between ac-tors with very different political and ideological orientations. Evidence from previous environmental direct action groups illustrates how diverse interests, motivations and tactics lead to irreconcilable tensions. 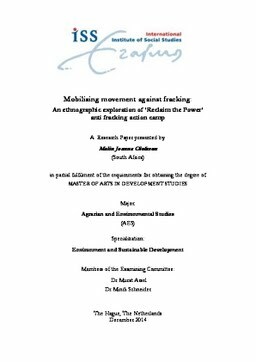 This study explores the diverse political and ideological orientations of activists at Reclaim the Power, their demands and objectives, how representation within the camp was negotiated and ultimately how their demands were expressed, as a means to explore the formation of broad based coalitions. Different approaches from the social movement literature are used for analysis. The study illustrates how despite diversity a strong coalition was formed based on the broad resonance of the framing of RTP as a social, economic and environmental justice movement. Framed as such fracking provided an anchor for broad struggles against the state and the political and economic system to form alliances with struggles over localised social and environmental risks facilitating the formation of diverse coalitions.